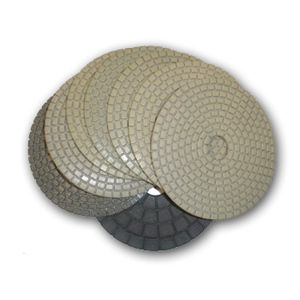 Dry polishing pads are used at sites where water is not accessible. Our unique line of dry pads offer great performance at extremely competitive prices. They can be used both dry and wet. The pads perform excellent on granite, marble, concrete and engineered stones. The series contain 50 grit, 100 grit, 200, 400, 800, 1500, 3000 and a black buff pad. Colors of the velcro are light green, red, yellow, light blue, green, orange and pink respectively. $13.95/pc on average. Save $8 when you order this set.